Samira Santos da Silva won 2nd place on the Master’s Thesis category of the Thesis and Dissertation Contest of the Workshop on Computer Vision, WVC 2018. 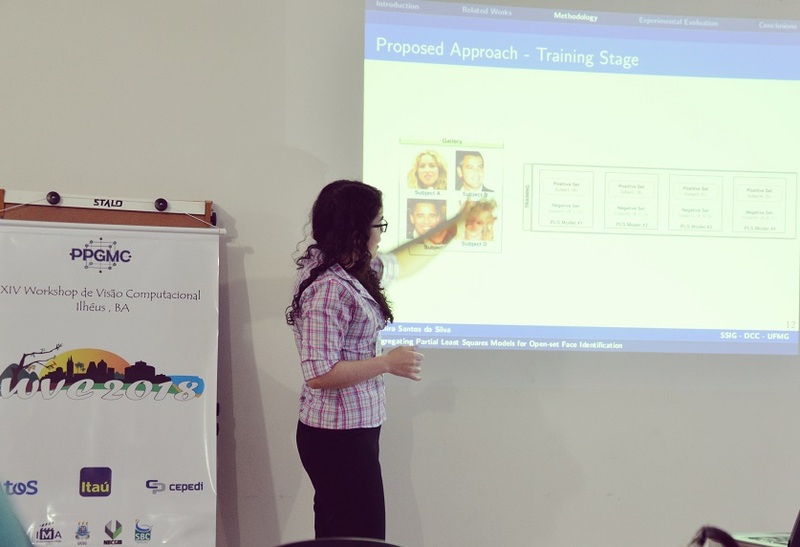 Currently, a Professor at the Itaúna University Foundation, the Smart Sense Laboratory’s graduate presented her research Aggregating Partial Least Squares Models for Open-set Face Identification, defended earlier this year. In its 14th edition, WVC was held from November 12-14, at the State University of Santa Cruz (UESC), Ilhéus, Bahia. Face identification is an important task in computer vision and has a myriad of applications in surveillance, forensics, and human-computer interaction. In her Master’s thesis, Samira had as main objective the identification of faces in open-set galleries, that is, determining whether a given face image belongs to an individual previously registered in the gallery of known individuals or not, and in the former case, also determining the identity of that individual. “The applications of this type of method are numerous”, says the researcher. “An example would be in a criminal investigation where it is desired to know if the face of an individual who has been captured by a surveillance camera is registered in a gallery of, for instance, criminals from a police database. In this case, the face identification would be performed only after making sure that the face actually belongs to a registered individual”, she explains. In her work, Silva proposes a novel method that aggregates Partial Least Squares (PLS) models using the one-against-all protocol in a simple but fast way. The model outputs are combined into a response histogram, which is balanced if the probe face belongs to a gallery individual and have an accentuated bin otherwise. Regarding the contributions of her work to the field, she comments that: “besides the way the models were trained, the combination of the responses obtained was also a contribution of the work that resulted in an effective method for the solution of this type of problem, surpassing the state-of-the-art methods in the literature”. Sense member from 2015 to 2018, Samira stated that being a member of the laboratory was an opportunity to grow both professionally and academically. “The group has a very strong collaboration culture that encourages its members to produce works of the highest quality. Of course, my award is also a merit of the group as a whole”, pointed the researcher. Samira Silva has a degree in Computer Science from the Federal University of Ouro Preto (UFOP), during which she also attended the University of Porto, Portugal. She defended earlier this year her Master’s thesis in Computer Science from the Federal University of Minas Gerais (UFMG). She also worked in the Department of Computing and Information Systems (DECSI) of UFOP from 2016 to 2018 as a Professor and in the authorship of distance education courses. Currently, she teaches at the Itauna University Foundation. Professor William Robson Schwartz, head of the Smart Sense Laboratory, advised Samira’s research. She also had contributions from Filipe de Oliveira Costa, from the Image and Speech Processing Management of the Center for Research and Development in Telecommunications (CPqD), her co-advisor. In its 14th edition, the WVC brings together researchers, graduate and undergraduate students who are working in computer vision. The event was organized by the Graduate Program in Computational Modeling in Science and Technology (PPGMC) and the Image and Action Group (IMA) of the State University of Santa Cruz (UESC) and the CEPEDI Institute. Follow updates of the Smart Sense Laboratory through our Facebook and Twitter.